Interested in some new and clever ideas for Valentine’s Day gifts and cards this year? 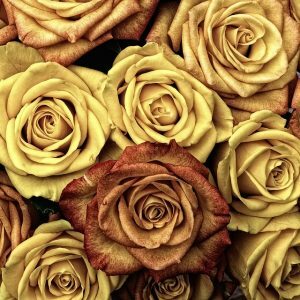 Try going with some steampunk style, and you’re sure to come up with an original and unexpected gift for your sweetheart.This article will give you some great Valentine’s Day steampunk gift ideas to choose from. Perfume is an old (sometimes musty) standby for a Valentine’s gift. 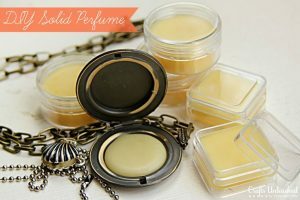 Personalize that gift idea a bit more, while adding some steampunk flair, by making her a solid perfume locket. Find a vintage locket with lots of personality, or just purchase one at a craft or jewelry store. You can even use that perfume you were going to buy her to make it. Such a beautiful, and useful new accessory would be a great excuse to dress up in steampunk attire for your Valentine’s Day celebration. Not sure what to wear? Steampunk goggles with red lenses would be a defining feature of any Valentine’s Day outfit. 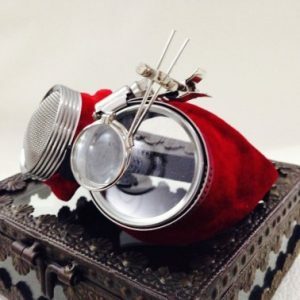 Whether you wear them atop a steampunked formal top hat, or on your face so that your eyes show through the deep red lenses, your Valentine will love that you dressed up for the occasion! Red lens steampunk goggles with red pearl decorations! Next, select a few other red-colored accessories to go with the new goggles. Maybe a pair of steampunk cufflinks for your dress shirt, or a top hat with embellishment! A matching gift idea for guys this Valentine’s Day is some homemade “Olde Spice” aftershave. Traditional wet shaving is really popular these days, particularly among men interested in connecting with the history of it. You may want to look into a straight blade or safety razor, with brush and mug set to pair with your homemade aftershave. 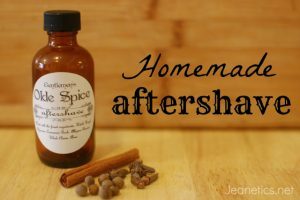 But plan ahead because the aftershave takes 10 days (mostly inactive time) to make! If your other half needs extra motivation to get dappered up to go out in full steampunk form this Valentine’sDay, these red suede steampunk goggles will add flare to any ensemble. Furthermore, if you’re really ambitious, these red suede goggles would look amazing with a classic red fox-hunting jacket. Or you may want to choose a simpler accessory to go with the goggles, like a red glass ornamented walking stick. If your personal skill-level for Valentine’s Day card making rivals that of a kindergartener with a glue stick, your best bet may be to peruse the beautiful handmade steampunk cards found online. Ranging from hand drawings, to digital art, to mixed-media cards, there’s a great selection of steampunk Valentine’s Day cards and you are supporting the actual artists who make them. If you feel up to the challenge, cards can be a quick and simple DIY project. Start with some really great steampunk themed image or clip art, like a vintage clock face, or mechanical diagram. Choose an original font for the text on the card (not one of your computer freebies). This free font is a really great one with a steampunk feel. Print up a traditionally cheesy Valentine’s Day message, or go authentic with some 1890’s poetry. Then print out your card on heavyweight cardstock and decorate with some tiny clock hands, or gears or whatever steamy scrapbooking embellishments you have on hand. Your sweetheart will be totally impressed. However you choose to celebrate Valentine’s Day this year, make sure to incorporate some clever steampunk elements!